Worthy of the exclamation point! Manuel Gonzales’ debut collection of short stories, The Miniature Wife and Other Stories, was so phenomenally good, and played with genre in such an interesting way, that I try to recommend it to everyone. So to say that my expectations for his first novel were high is a vast understatement. 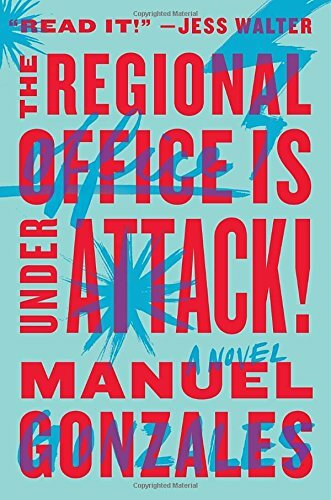 And, for the most part, The Regional Office is Under Attack! doesn’t disappoint. The story is primarily composed (and I say primarily because there is a brief interlude that uses a “we” narrator that slowly transforms into an “I” narrator in a thrillingly done way) of two alternating character viewpoints and an additional viewpoint written as a distant, but maybe not so distant, laboratory report voice. The plot concerns the Regional Office, a secretive organization that tries to keep the “forces of darkness” at bay. They do so through carefully organized missions and a team of highly trained super-powered women (think: potential Slayers, if you’re a Buffy fan). As the title states, the Regional Office comes under attack (and we see this from the viewpoint of one of those highly trained women: Rose) and the only person who seems capable of defending it is our other viewpoint, Sarah, an office manager who just so happens to have an extremely high-powered mechanical arm. The novel zips along, I read it one sitting, in a propulsive way. Gonzales’ use of pacing and action-scenes to push along the story in a way that should feel formulaic, instead just comes across as enjoyable. Spread throughout is a good deal of humor, enough pop culture references to annoy many a reader (though, I thought they were excellently utilized), and some truly beautiful pieces of writing. My hesitancies with wholeheartedly declaring this absolutely brilliant come from a few places, however. While both Rose and Sarah are thoroughly interesting and well-drawn protagonists, I felt neither entirely got the space that they deserved. Maybe that would have slowed the book down too much, but it still felt lacking. Additionally, I wanted to know more about the other members of the Regional Office, and the broken off faction that attacks them. I feel we only truly understand one character, that of Henry—a recruiter for the agency and a key player in the novel’s events. His motivations are clear and he comes across as fully rounded in a way that most of the side characters do not. Still, if you want a thoroughly fun read that’s also incredibly well-written and smart, then I highly advise picking this one up!